Daphne Caruana Galizia’s family has filed a constitutional application against the Planning Authority over the removal of a banner about the journalist’s murder from a private property in Valletta. The family is calling on the court to declare the PA’s removal of the banner in March, and a second time two weeks later, an abuse of power and a violation of the right to free speech. The banner, affixed to the facade of a house in Old Bakery Street, which was removed by the Planning Authority. 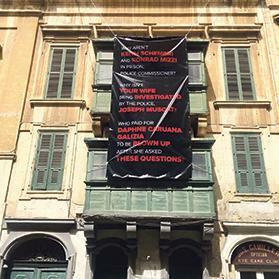 The banner, affixed to the facade of a house in Old Bakery Street on March 31, posed three questions related to Ms Caruana Galizia’s murder and investigations. The banner was removed by the PA a week later, on April 7, after a notice that it was in breach of the Billboards and Advertisement Regulations. A second banner put up by the family on April 15 was removed without warning by the authority after just 12 hours. However, in the constitutional application, the family claims that the banner did not constitute a “billboard” or “advertisement” as defined by the regulations, and therefore that the PA had no authority to order its removal. The family wrote to the PA over the matter the day after the second banner was removed, according to the application, to which the authority responded by accusing the family of acting “in an arbitrary manner and in flagrant violation of the law”. “It is clear that the claimants had every right to affix the banners without seeking permission from the [PA] and that the removal of the banners was a clear abuse of power … amounting to a violation of the right of the claimants to express themselves and put forward their message,” the application states. It was signed by lawyers Therese Comodini Cachia, Jason Azzopardi and Eve Borg Costanzi. The removal of the banners in March and April came just weeks after the PA similarly took down three billboards calling for justice in the case of Ms Caruana Galizia’s murder. While the PA insisted the billboards had been illegal and that their removal was not related to the contents, the activists behind them labelled the authority’s action a “vile act of suppression”. Last month, the PA also removed some 900 posters and placards hung on trees along the Rabat road, as well as in Sliema and Valletta. The posters questioned Malta’s rule of law and challenged the authorities to find the people who commissioned the murder. The PA claimed the posters were once again in breach of the Billboards and Advertisements Regulations, as well as being “unsightly” and creating a traffic hazard.